If you would like a topic specifically covered in next week's video please comment. Thanks for tuning in and please follow my blog for updates. 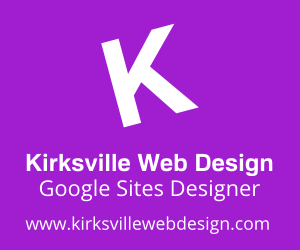 You can visit my youtube channel at http://www.youtube.com/user/kirksvillewebdesign. Rob from youtube reporting in lol. Very impressive indeed. Sites has come a long way. Thanks for sharing. Very nice tutorial. How do you make the gif file to import onto the site? I make my .gif files using GIMP. Which I think if you Google "GIMP tutorial .gif animation" you should have some good walkthroughs on making a solid one. And like I said, I upload to a third party site and then insert that image via link. I have been checking out some of your posts and i can state pretty good stuff. I will make sure to bookmark your site.